Debbie Davis and Matt Perrine at home. Photo by Elsa Hahne. Without music, how many would never have fallen in love? Without love, how many songs would have never been written? And yet two musicians in an intimate relationship sounds like romantic chaos. 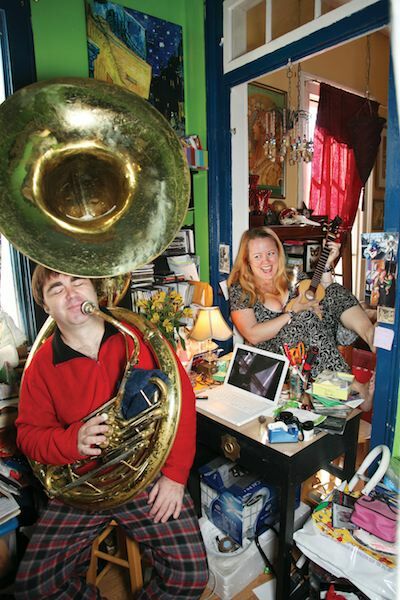 Not so for respected local low-end specialist (sousaphone/bass) Matt Perrine and wife Debbie Davis, best known for her interpretations of songs by the Boswell Sisters and Andrews Sisters as a member of the internationally renowned Pfister Sisters. Together and apart, Perrine and/or Davis perform almost daily, playing everywhere from Late Night with David Letterman to the New Orleans Public Library. Their fairy-tale musical journey together begins at Jazz Fest 1997, but perhaps really takes off during one of the couple’s first serious collaborations at the now- defunct Warehouse District bar, the Mermaid Lounge. But let’s first return to that fairytale Jazz Fest. “You wanted to have all your basses covered,” Debbie adds. Debbie Davis and Matt Perrine. Photo by Elsa Hahne. Davis had no qualms. This was what she’d grown up with. “My parents were both opera singers,” she says. “Both traveled a lot, together and separately. I didn’t even attend a full year of school till fourth grade because we’d be touring everywhere. So there was never a doubt in my mind that two musicians could work and have a family. It’s easier than one musician and one civilian, actually, because we both know what’s at stake and what sacrifices have to be made. We both understand when one of us can’t come home. And kids—kids get used to what you get them used to. “Lately, from nine o’clock in the morning, I write until the kids get home.” says Perrine, whose at-home time ebbs and flows. “A lot of times my life is like other 9 to 5 dads. I’m just in my house doing it. Sometimes I’m here recording for days. At those times, my life feels very traditional.” Currently he is spending his days writing and arranging four songs for the Dukes of Dixieland to use for their pops concerts—compositions that will first be performed in Boston, with the Boston Pops playing Perrine’s arrangements into existence. “Then, coming up during Mardi Gras, I will be out every night, like all the other musicians.” Perrine continuously gigs with the Tin Men and other Alex McMurray concoctions, plus the New Orleans Nightcrawlers, the Midnight Disturbers, various collaborations with Paul Sanchez and his own band, Sunflower City. Davis has gotten the green light to record a solo album for Threadhead Records, featuring original music by Alex McMurray and Paul Sanchez, plus obscure standards and “more standard standards,” she says. What a great story! and only possible in new Orleans! Great article! Love to you both, Matt and Debbie. Fantastic!!! Congrats to you both Debbie & Matt.